Again, another movie based on a book I haven’t read. Lauren, on the other hand, did read Memoirs of a Geisha (pronounced gay-shu, not ghee-shu or guy-shu as I have pronounced it before) and enjoyed it very much. Now that I’ve seen the movie, I don’t think I’d find the book as satisfying as she did. 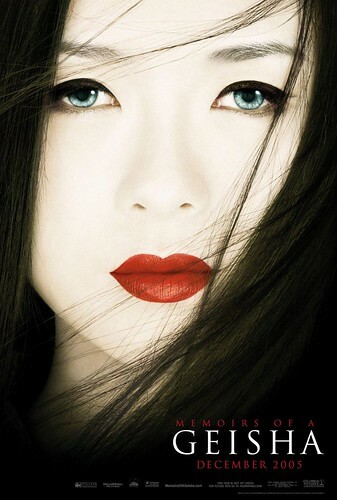 To be blunt about it, Memoirs of a Geisha would have been much more enjoyable if it had been in Japanese with English subtitles. Instead, it’s a lot of non-Americans trying to speak English and only succeeding 80% of the time. Nothing is more frustrating when watching a movie than to have to stop the movie, rewind, and listen again to what’s being said in an attempt to decipher poorly spoken dialogue. This gets old very quickly. What were supposed to be touching moments became frustrating moments as Lauren and I tried to figure out what the heck the characters were saying. Clint Eastwood did it right; his film Letters from Iwo Jima, which hits theaters soon, is in Japanese, the language the characters portrayed in the film would speak. It feels more authentic this way. Memoirs should have done the same. I suppose I could have turned on the subtitles for the film, but frankly I didn’t think of it at the time, and besides, I think I would have found it equally annoying; hearing and reading the same language would get confusing. My mind wouldn’t know what to pay attention to. Had the characters spoken in Japanese, my mind would note the inflection in the voice, the emotion behind the words, while ignoring the words themselves completely, allowing the rest of my mind to read the subtitles and understand everything I needed to about the character and scene. As it is, Memoirs was hard to follow. Of course, what I propose would never have worked since the actors in the film are not Japanese, at least not all of them. They’re Chinese. They speak neither English nor Japanese. Ken Watanabe is Japanese, but his English wasn’t all that bad. It was the Chinese characters who were hard to follow. Were I a kinder person I’d be applauding the cast, since, if I’m not mistaken, some of them spoke no English at all prior to the film. They learned to speak it on the job, with the camera there rolling in their faces. But I’m not kinder than I am because I don’t think they should have been cast in the first place. Visually, the film is stunning. The town in which it is set was spectacular. I’m sure it was all CGI and Hollywood set, but it appeared authentic, pre-war Japan in all its homes-clustered-together glory. In that sense, Memoirs was like watching a National Geographic documentary on urban life in Japan in the 40s. I enjoyed that aspect of the film very much. And credit is due to the other technical aspects as well: the costumes were beautiful; the cinematography, beautiful; the cast, beautiful. I just wish they spoke Japanese.